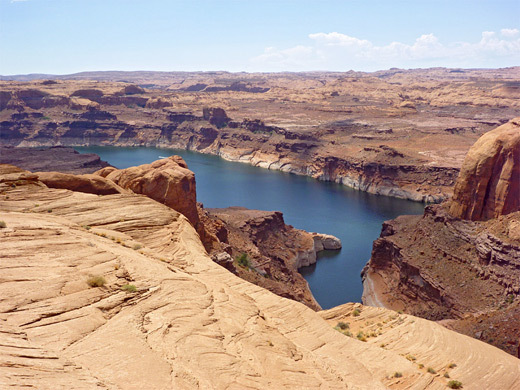 Lake Powell has hundreds of narrow tributaries, the majority difficult to access, requiring either drives on 4WD tracks then cross-country hiking, or approaches via boat, entering from the lower end. 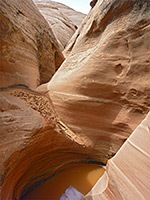 One area reasonably close to a paved road is on the north shore of the lake, northeast of Bullfrog Marina, where various tributaries of Smith Fork, Warm Springs Creek and Sevenmile Creek form slot canyons through the light-colored Navajo sandstone that borders the majority of the lake. Many need one or more rappels to explore properly, but often a good amount can be seen without equipment. One of the shorter canyons is the unnamed drainage adjacent to Sevenmile Creek on the east side, so could be designated East Sevenmile Canyon. The lower few hundred feet are flooded by the lake, while upstream, above high pouroffs, are two forks, forming relatively shallow but still pretty slots. The west branch has been called Montezuma Canyon, and the shorter east branch is known as Tripoli Canyon. As well as the narrows, the place is also notable for good views of the lake, here less than a quarter of a mile wide, enclosed by sheer cliffs and surrounded by vast expenses of slickrock. 14 views of East Sevenmile Canyon. Sevenmile Creek and adjacent canyons may be reached by driving on unpaved, sometimes rough roads starting at an unsigned junction on Hwy 276, 2 miles north of Ticaboo. A 4WD vehicle is generally required, though regular cars can drive some of the way, and as the surroundings are flat or gently sloping, and treeless, cross-country hiking to the canyons is straightforward. The drive to the vicinity of East Sevenmile Canyon is 10.2 miles, mostly on BLM 13400, and is reasonably smooth for about 3.6 miles, to the top of a ridge above the wide drainage of Smith Fork; the surface becomes rougher as the track descends to the stony wash, which is followed downstream for a short distance. The ridge may be a suitable parking place for low clearance vehicles. After climbing up the far side of the wash, the track ascends gradually to a broad, flat, grassy plateau, passing several junctions while heading generally northeast. Another junction is reached after 7 miles from the highway; the route is along the south branch then left and right at two more junctions in quick succession, now on road BLM 13480. This runs southwest, past two more intersections and soon comes within sight of the upper end of the canyon - the suggested parking place is at the southernmost point, 2.7 miles from the start of 13480. The cross-country walk to this place from the 2WD parking place is around 4.7 miles, compared with 6.6 miles by road, which veers more to the north, to avoid uneven land near the various upper forks of Sevenmile Creek. The northern rim of the canyon is just 500 feet south of the road, and like many drainages in the vicinity, the slot parts are surrounded by wide bands of undulating Navajo sandstone slickrock, above which is a line of cliffs of the darker Page sandstone, up to 40 feet tall and mainly sheer, so routes down are not obvious. One possible approach is half mile southwest, near the end of a narrowing promontory, where a gully leads to a little tributary, reaching the west fork of the canyon in a temporarily wider place, inbetween its upper and lower narrows. Another route is 0.4 miles further along the road and then due south for 700 feet and down similar little gully. At the foot of here, the upper end of the east fork is a short walk southwest. 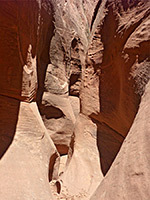 The two forks of the canyon have several slot sections, some containing unclimbable falls, but the narrows are separated by less enclosed parts allowing entry or exit. Upstream of the approach used for the west fork is a short slot section leading to a dryfall beneath a round chokestone, while downstream are some longer accessible passageways, thin and twisting at floor level, and containing several potholes. 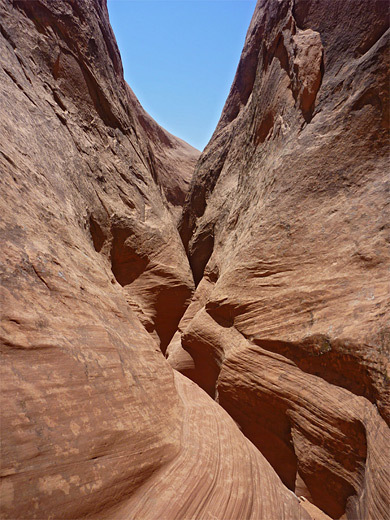 A bigger fall puts a stop to easy progress, and the end of the canyon is not far ahead - a 250 foot drop off at the edge of the Navajo sandstone, down to the Wingate benches bordering Lake Powell. The east fork of the canyon has several sections of shallow narrows before a sheer drop of about 50 feet while only one or two feet wide. 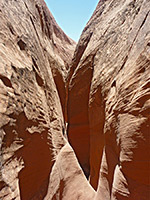 Several narrow ledges might assist if climbing down. 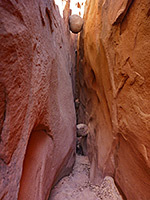 Neither fork becomes particularly deep, as can be seen by walking south along the canyon rim and looking back north to the end of the slots. The lake extends close to the base of the cliffs, flooding the lowest section of the canyon; to the south, the main channel curves through quite a tight bend bordered by vertical walls up to 500 feet high. The slickrock hills above the slots give good if partially obscured views of the lake, and an even better perspective can be obtained by walking further south, for another third of a mile, to the edge of the cliffs.